Her talent was first spotted in 1916 when she joined Arthur J. Wilkinson, a Burslem maker of standard transfer-printed earthenwares. She trained at art school and was eventually given her own studio and a team of paintresses to work with her on more experimental wares. Based at the Newport Pottery warehouse, the team first used old Newport blanks which they covered in the brightly coloured and distinctive designs that were launched in 1927 as the Bizarre range. The associated Fantasque range evolved between 1928 and 1934 and mainly featured abstracts or landscapes of cottages and trees. A Clarice Cliff lotus vase decorated in the Blue Lucerne pattern which sold for £3400 at Maxwells of Wilmslow in January 2016. 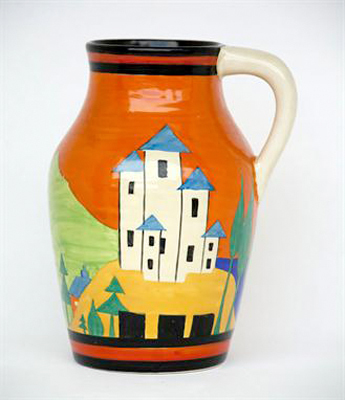 The Staffordshire born and bred designer Clarice Cliff made her name with the brightly coloured range of Art Deco pottery she designed in the 1920s. Her talent was first spotted in 1916 when she joined Arthur J. Wilkinson, a Burslem maker of standard transfer-printed earthenwares. 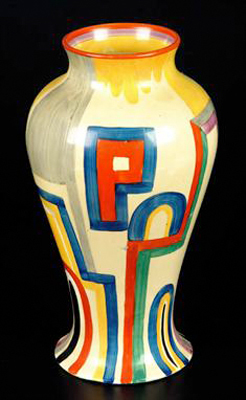 Although pieces carrying the Clarice Cliff name were still being made into the early 1960s, the production of Bizarre pottery proper covered a relatively short inter-War period. Production began in 1927 and had largely ceased by 1942 when the Newport pottery closed and the remaining Clarice Cliff team moved back to Wilkinson's. Colley Shorter died in 1963 and the following year Clarice sold the Wilkinson's factory to Midwinter which was by then the fashionable producer of tableware for modern tastes. 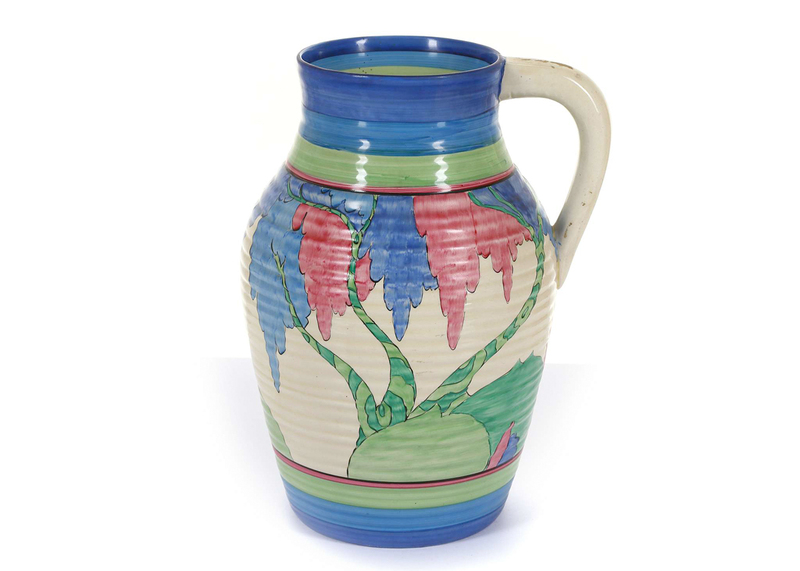 One reason why Clarice Cliff pottery has been so attractive to collectors is that there is enough of it around to make it available to a large collecting base but not so much as to render it ubiquitous. And as some ranges and patterns were produced in much smaller quantities than others, that lends the ceramics a definite price structure. 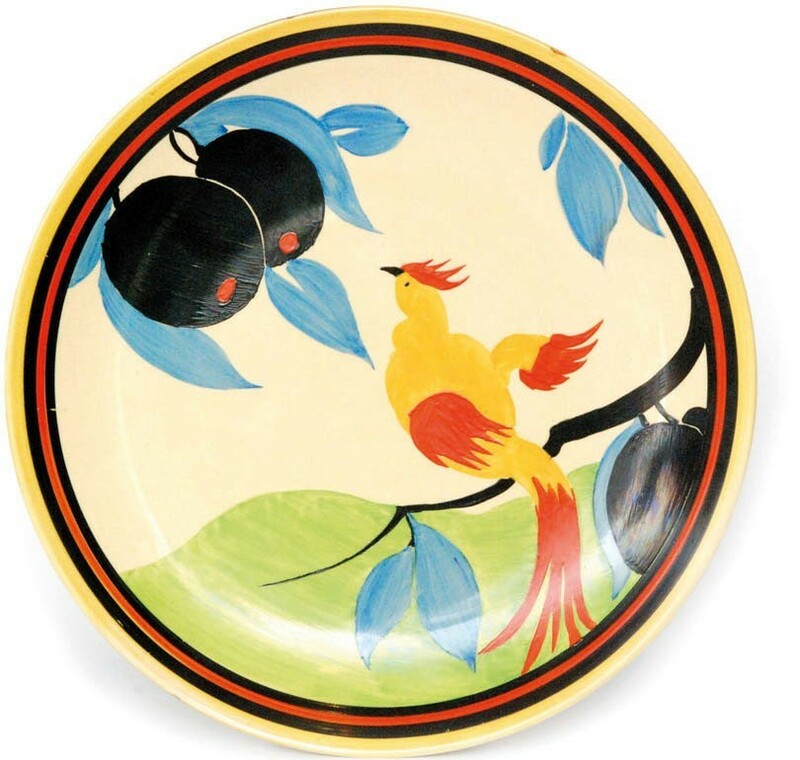 Buyers are predominantly British or from the Commonwealth countries where Clarice Cliff was exported in the inter-War years (Bizarre and Fantasqueware was sold throughout North America, Australia, New Zealand, South Africa, but not in mainland Europe). There are still collectors with strong collecting pockets in Australia and Canada. Shapes and patterns dictate the collecting hierarchy. Scarcity is a key factor. 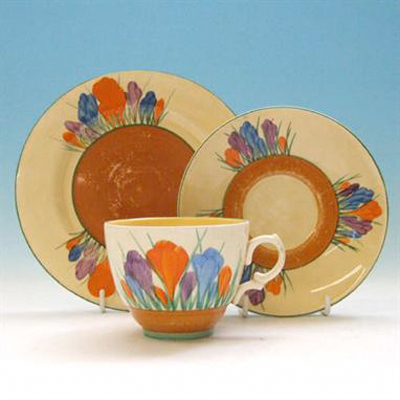 The floral designs, such as Autumn Crocus pattern, were produced in large volumes, often for regular domestic use, so while popular with collectors, these are relatively inexpensive. At the other end of the spectrum are patterns from the short-lived Appliqué range, made 1930-31, which required many more man hours to decorate. There are patterns such as Sunspots for which only around 20 examples have been located, while wares in unrecorded experimental patterns continue to be discovered. Shapes are as important as patterns when it comes to Clarice Cliff. 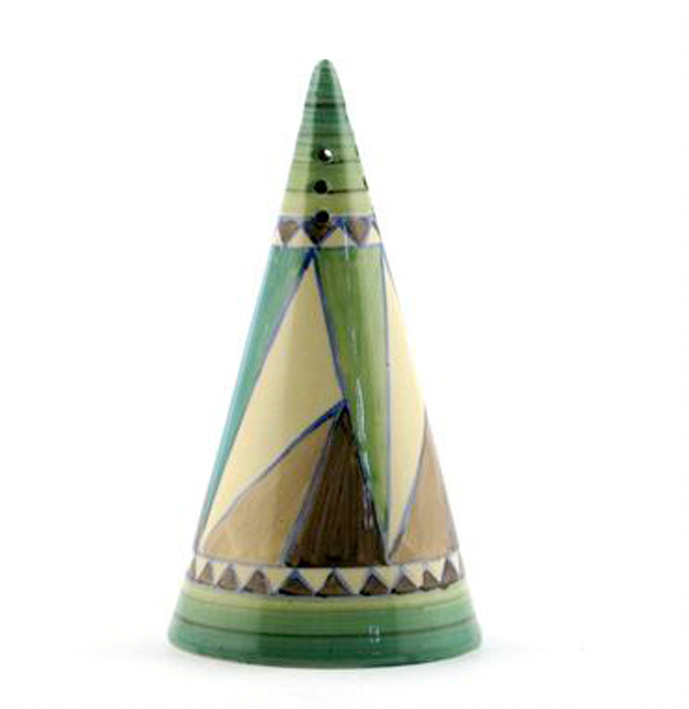 The distinctive conical form of her sugar sifters for example makes them highly collectable. This example, which sold for £650 at Woolley and Wallis in April 2010, also had the bonus of a rare Killarney pattern. Broadly speaking, buyers want their Clarice Cliff wares to evoke the Deco era, so alongside bold floral and abstract patterns, they covet equally bold angular shapes. Conical sugar sifters, Stamford-shaped teapots and YoYo vases command a premium way above pieces in the same pattern but of more traditional form. Some patterns were applied to multiple shapes: Bonjour had 20 shapes created during 1933, with about 10 more being added in 1934. 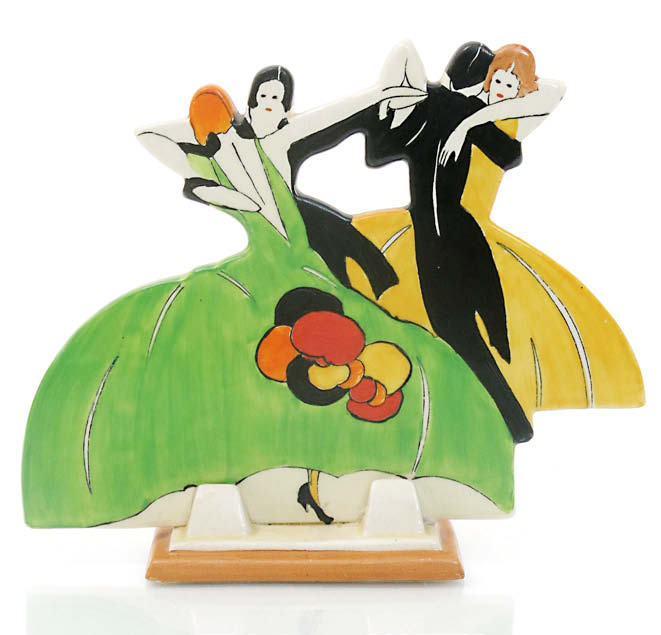 Rarities such as the Age of Jazz flat-back figurines, the geometric face mask designed by Ron Birks, the Lido Lady ashtray or a vase shaped as the prow of a liner (an example of which sold for in 2001 at Bonhams for £13,000) are at the very top of the price pile. 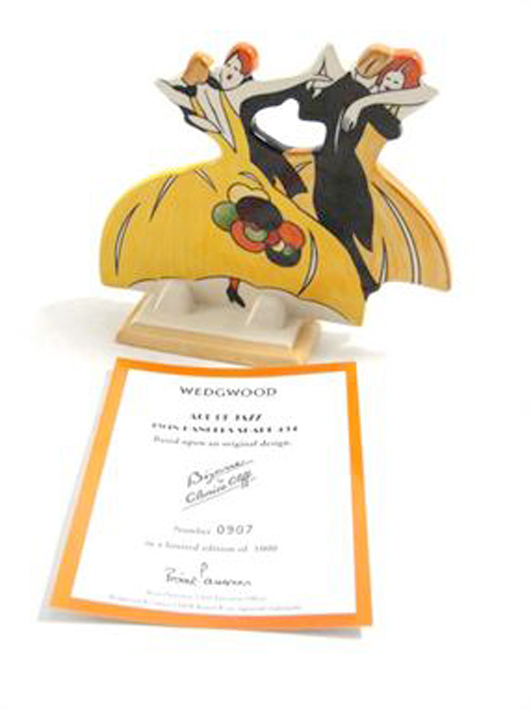 Founded in 1982 and still going strong, the Clarice Cliff Collectors' Club is a premier source of information about the designer, her work and patterns, shapes and values. It was an exhibition held at the Brighton Museum in 1972 that signalled the first major revival of interest in Clarice Cliff's pottery. Four years later there was another seminal exhibition held at the London gallery L'Odeon. 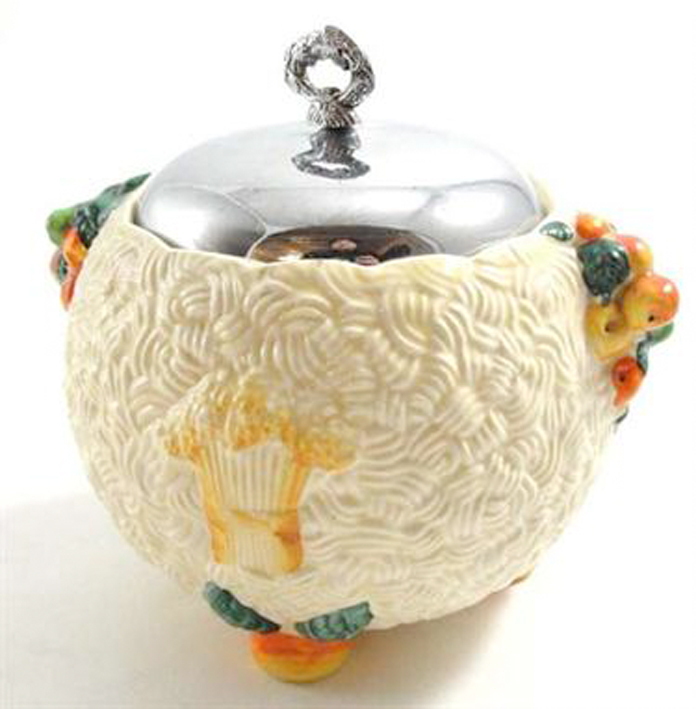 A growing wave of interest followed and, with the onset of the 1980s, these stylish table and ornamental wares generated much of the excitement they had in the 1920s. Numerous books ensued, the collectors' club was founded in 1982 by collector/author Leonard Griffin and there was a memorable documentary about the Bizarre Girls, Clarice's team of paintresses (fortunately enough the 'girls' were still alive to make for some first-hand interviews). 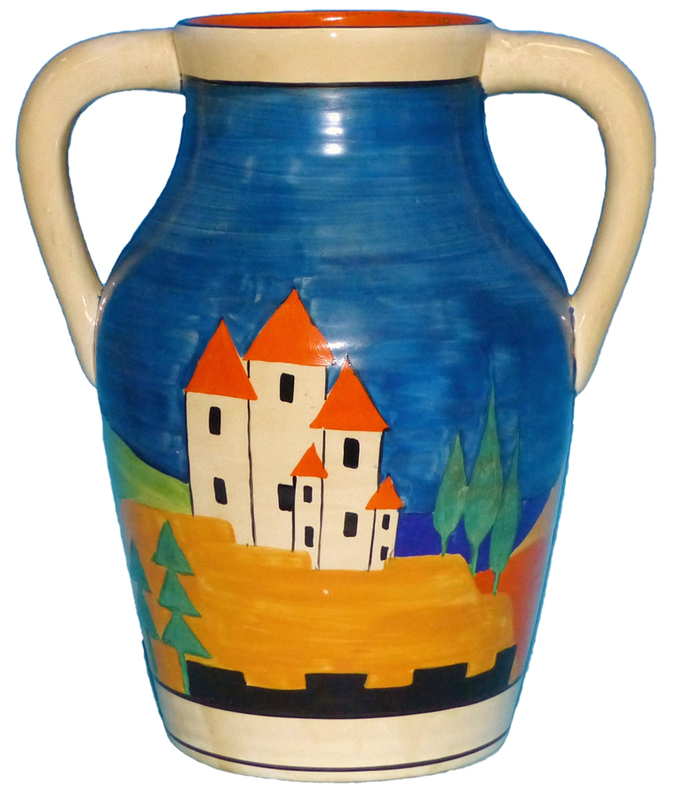 The collecting market for Clarice Cliff pottery is complex. It is still possible to find examples of Crocus, Cliff's longest produced pattern (1928-1964) and some of the more pedestrian relief-moulded wares such as Celtic Harvest for as little as £20-50. But rare combinations of shape and pattern attract very high prices at auction. Condition will always have a bearing on value, especially as Clarice Cliff's overglaze hand-painted decoration is particularly prone to paint flaking. At the peak of interest in the 1980s and ‘90s, there were regular specialist auctions at Christie’s South Kensington and a number of specialist dealers whose stands at antiques fairs were devoted to Clarice. In 2003 Christie’s sold a rare charger with the striking and much sought-after May Avenue pattern for £34,000, a price that is still the auction record for Clarice Cliff. It is perhaps telling that another version has since sold for £20,500. The May Avenue pattern embodies many of the features that Clarice Cliff collectors covet – bold designs and semi abstraction. 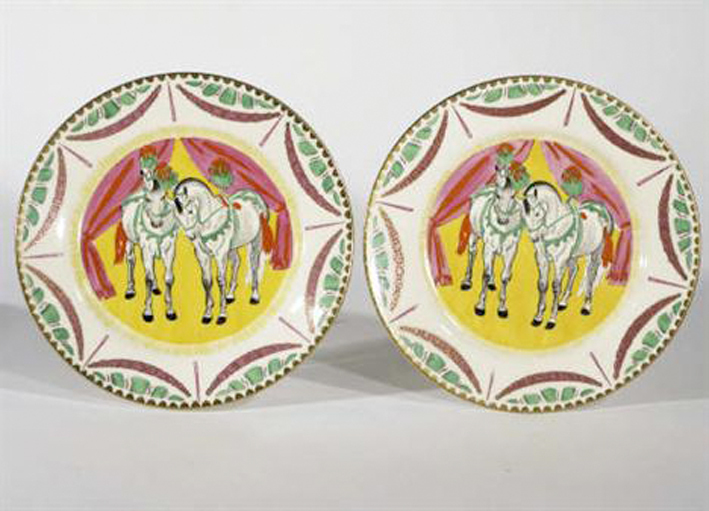 This May Avenue charger for example realised £20,500 at the Fieldings Clarice Cliff Collectors’ Club auction in May 2009. Another example sold for £34,000 at Christie’s South Kensington in 2003, a price that is still an auction high for Clarice Cliff. Clarice prices probably peaked around the turn of the century and have since fallen. 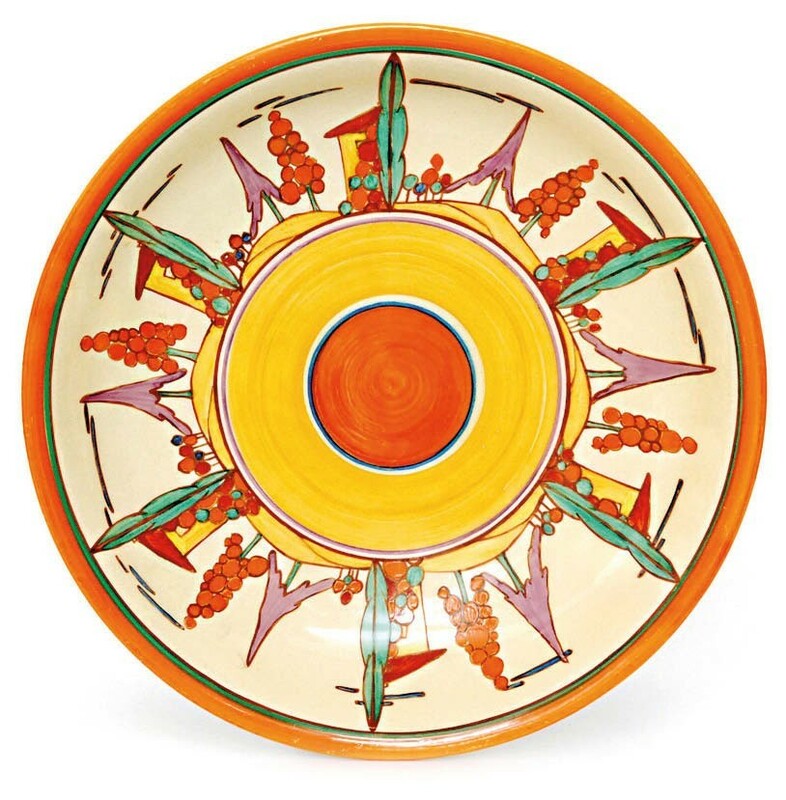 In 2007 the sales at Christie's, an annual focus for the collecting community, ceased and London sales now tend to feature Clarice Cliff sections in broader mixes of decorative pottery or design. Specialist sales have now been revived by Stourbridge firm Fieldings in association with the Clarice Cliff Collectors' Club. Rare pieces are still expensive but prices are dramatically down on their zenith. There have been some interesting tests of the market in recent years, particularly the sale of the Sevi Guatelli collection (at Bonhams in March 2009 and subsequently at Woolley & Wallis in Salisbury and Lyon & Turnbull in Edinburgh) which offered top range, blue chip scarcities bought at the height of the market. Some further encouragement for the market came in March 2018 when an American private collector bid £15,000 for a rare Age of Jazz figure group at Woolley & Wallis – a sum thought to be an auction record for a figure from this 1930 series. Further down the scale, many good pieces of Clarice Cliff can be bought for under £500, as demonstrated by the results from a collection of close to 300 typical pieces sold at Chiswick Auctions in January 2018. Perhaps for the first time since the 1980s – it is now primarily a buyer’s market.